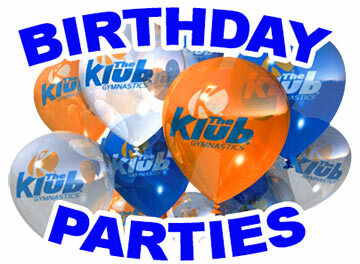 Come and celebrate your child's next birthday with The Klub Gymnastics! Our gym is a fun and safe recreational space where your child can run, jump, climb and bounce around in with their closest friends. Bring in your cake, food and decorations and we'll take care of the rest! The birthday child and their guests - ages 3 years old and up - are lead by our Koaches through games and activities out on the programming floor while grown ups are invited to sit back and relax in our spacious party room. 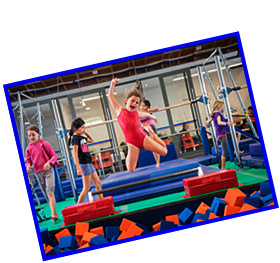 This time includes guided use of trampolines, beams, bars, foam pits, etc. Guests have the opportunity to tackle exciting obstacle courses, play inspiring games, and learn new gymnastics skills. These parties run for 2 hours with 1.5 hours being on the programming floor and half an hour of food, cake and socialization in the party room. The birthday toddler and their guests - ages "walking" to 3 years old - are lead by our Koaches in exploring a new and exciting environment. There are opportunities for structured activity such as "Circle Time" and "Trampoline Time," but during these parties the toddlers are free to roam in a space designed specifically for their level of activity. For Toddler Time parties, we require participation of one parent per child on the programming floor. The role of the parent is to help introduce their child to the equipment while our Koaches encourage them to try new skills. The birthday ninja and their guests - ages 5 years old and up - are lead by our Koaches through structured courses that put physical and mental abilities to the test. Guests are encouraged to create a "Free Form Flow" that helps them move through individual and team building challenges. 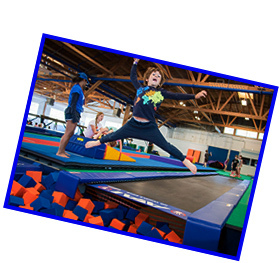 Activities include climbing, crawling and rolling using our Ninja equipment; running up the Warped Wall; leaping and swinging on the Pipe System; and more! The birthday adult and their guests are guided through a series of fun yet challenging exercises that can be adjusted to all ages and abilities. This is an opportunity to brush up on old skills or adventure with new ones! The structure of Adult Parties are flexible but generally start with a Koach-led group warm up and then move on to different equipment of the birthday adult's choice to work on strength, flexibility, balance and coordination. After gymnastics activities our Koaches lead guests into the party room for food, cake and celebrating. TKG staff handles serving food, cutting cake and cleaning up. When the party is over we help load up gifts and leftover party supplies. The birthday child receives a TKG birthday shirt and balloons to take home with them! 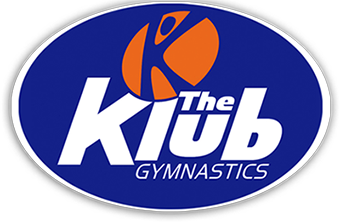 If you would like to book a birthday party with The Klub Gymnastics please click on the link below and register for an available date/time. When registering we will require a $100 deposit. After receiving your registration, TKG will send you a link to a Birthday Party Contract that will need to be completed within two business days in order to book your party. After receiving your signed contract, your $100 deposit will become non-refundable and your party will be officially booked. From there we will move forward with helping you send out invitations and prepping for your party!